This newsletter is about japa. What kind of japa? Japa that’s mindless, heartless and robotic. Japa that ends up being more of a ritual, a chore to get over with, rather than an act of loving devotion. You know what I am talking about. We’ve all been there, done that. And it’s time to move on to bigger and better things, like being fully present when we chant Krsna’s lovely and attractive names. “Nish, nish, ram, ram, nish, nish, ram, ram.” Prabhupada once imitated how we sometimes chant without focus, without concentration, without proper pronunciation – how we chant when we don’t feel like chanting. You know the mood behind this chanting: “I have to chant but I’d rather be doing something else.” And in our minds we are thinking, “I can’t wait to get these rounds out of the way.” We all do this. And it can get pretty bad. I know devotees who chant rounds while watching football games on TV. Prabhupada explained that this type of chanting is more or less useless because it will not produce the desired result, love of Krsna. To even call this chanting is a stretch. It is closer to a ritual. But Prabhupada acknowledged the value in the ritual by saying that although this kind of chanting is not very productive, at least those who are chanting this way are keeping their vow to chant. I call this kind of japa, “courtesy japa.” “Courtesy japa” means that since you have taken a vow – either to your spiritual master or yourself – to chant a certain number of rounds daily, you keep that vow while chanting the kind of japa I described above. Chanting while talking to someone (you talk, and when they reply you chant). Chanting while reading (which could really work if you have two heads, one to read and one to chant). Chanting while listening to a CD or the radio (this is especially challenging while listening to the news or listening to rock and roll music). Chanting while window shopping (this often happens on early morning japa walks). Chanting while you are dosing off (sometimes known as dive bomb japa). Chanting while site seeing or looking around at a million things (sometimes known as radar japa). Chanting while watching movies (Krsna Conscious movies are included in“courtesy japa”). Chanting a little, talking a little, chanting a little, talking a little (sometimes known asjibber japa). Chanting while …………………… (fill in your favorites). “Courtesy japa” is like shooting a gun with blank bullets. When the trigger is pulled it just sounds like a bullet is being fired. Obviously you can’t win a battle firing blanks. Similarly, “courtesy japa” sounds like the Hare Krsna maha mantra but it is just an empty sound, a shadow of the real thing. Certainly you can’t win the battle with maya firing blank mantras. The problem is – and this is something we have to accept philosophically as well as practically – if you keep practicing the wrong way, you’ll continue to get wrong results. What’s more is that bad chanting tends to produce more bad chanting. Let me say that in another way because this is really important. The more you practice the wrong way of doing something, the more it gets engrained and programmed within you and the harder it usually becomes to change. Thus it doesn’t necessarily follow that the longer you chant the more advanced you will become. Do you have a severe case of courtesy japa it is programmed into you? If so, ask yourself how you are going to kick the habit. This is an important question to answer because good japa is the foundation of your spiritual life. It all boils down to fighting apathy in your japa. 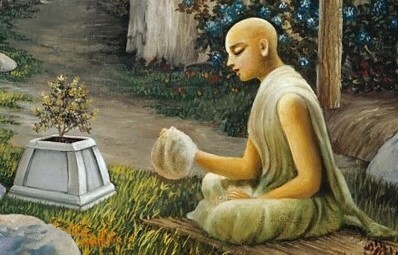 As Lord Caitanya said, playing the part of a conditioned soul, “I am so unfortunate that I have no attraction for chanting Your Holy Names.” So you have two choices during japa: one is to go with the flow and just let your mind wander. The other choice is to go against the flow and make a valiant effort to focus on the holy name and chant in a prayerful, devotional mood. That’s not so easy. It takes effort. It goes against everything “courtesy japa” stands for. And this is not much fun for lazy japa chanters like me. After all, concentrating is hard work. Japa can be a creative time. Often when I chant I get all kinds of ideas. Also the many things I have to do in the day – and even creative ways of doing them – keep popping up in my mind (or should I say keep pooping in my mind). Don’t dwell on these. If they come up, either neglect them (those good ideas will most likely come up later) or stop chanting and write them down so you don’t have to think about them while you chant. How will you break the habit of “courtesy japa?” Krsna is in your heart and He will help you as much as you want to be helped. Krsna says from Me come knowledge, remembrance and forgetfulness. So He will show you how to become a master of japa or a master of “courtesy japa.” It all depends on what you want. If you want to improve, He will show you when to chant (hint – early in the morning), where to chant (hint – where you are not distracted), how to chant (hint – with full energy and attention). So here’s the exercise. Write on top of a piece of paper, How To Improve My Japa? Below that write the subtitle, Putting an end to“courtesy japa.” Then make your list. Let’s put an end, once and for all, to “courtesy japa,” the great enemy of Krsna consciousness.